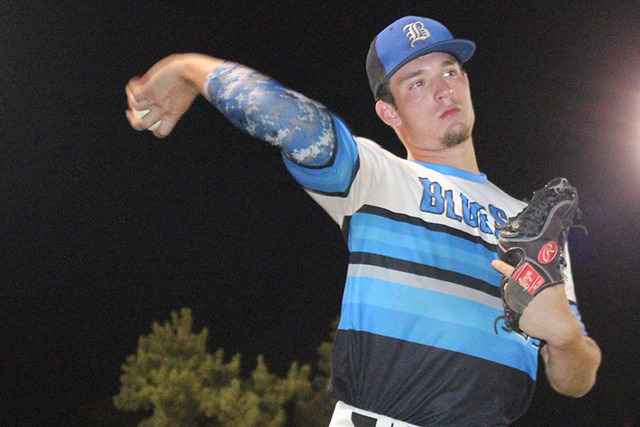 For Trent Bixby, the Sunrise Region Player of the Year this past spring, it’s irrelevant to him just how dominating he can be for the Southern Nevada Blue Sox. His main concern is one thing: the team. 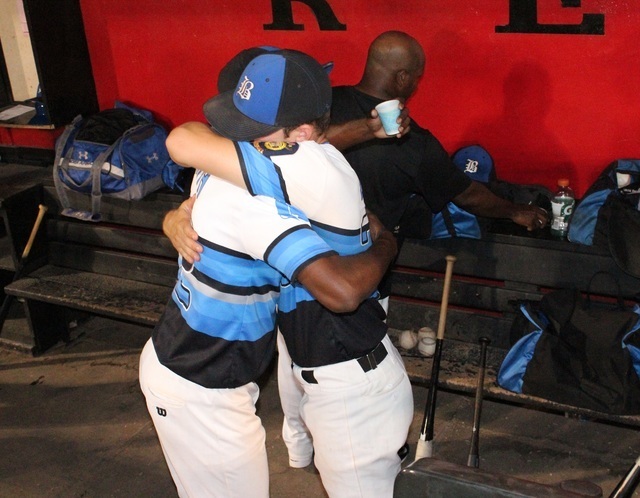 For Trent Bixby, the Sunrise Region Player of the Year this past spring, it’s irrelevant to him just how dominating he can be for the Southern Nevada Blue Sox. His main concern is one thing: the team. 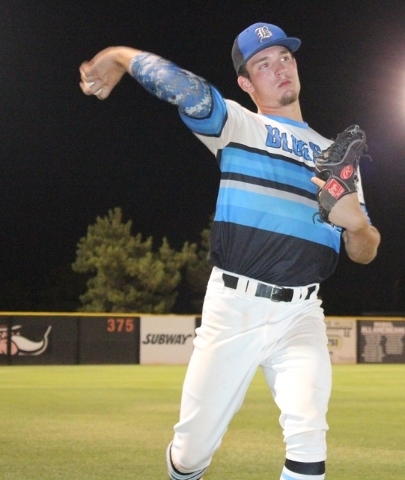 That could be the reason he commanded Monday night’s second round game in the American Legion State Tournament — the 6-foot-1 pitcher led the Blue Sox to a 9-2 victory over Silverado. Bixby (7-1) scattered seven hits over 6 1/3 innings while striking out 10 with an array of pitches, including a nasty breaking ball that froze several batters throughout the night. But it wasn’t the way he performed, albeit that helped, as much as it was his demeanor before, during and after the game. Even when manager Scott Baker removed him in the seventh inning, Bixby was composed like a true leader of his team. 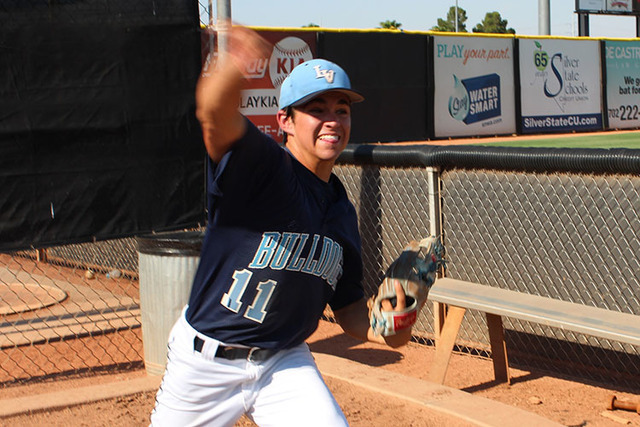 The Blue Sox (43-11), made up of players from Basic and Green Valley High Schools, has clearly carried momentum over from the spring season, when Basic won its first state championship in 29 years. The veteran-laden team next plays Thursday, and pending several scenarios, could be one win away from advancing to the championship game. As Bixby said, there are no heroes on the team, and Monday was no different with eight of the team’s 10 batters getting at least one hit, and six of them scoring at least one run. David Huddleson was 2-for-2 with three walks and two runs scored, Ryne Nelson went 2-for-4 with two runs scored and three RBIs and J.J. Smith added a solo homer just behind Bixby’s shot in the second frame. 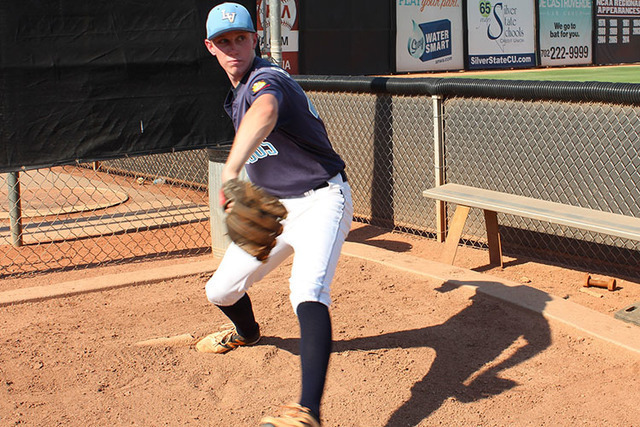 Nonetheless, Baker said his Blue Sox have taken things one game at a time, and haven’t gotten ahead of themselves. Silverado (17-14) was led by Dax Fellows, who was 3-for-4 with a run scored, while Michael Camburn and James McCarty each had two hits. Tyler Paasche (2-5) took the loss for the Hawks. 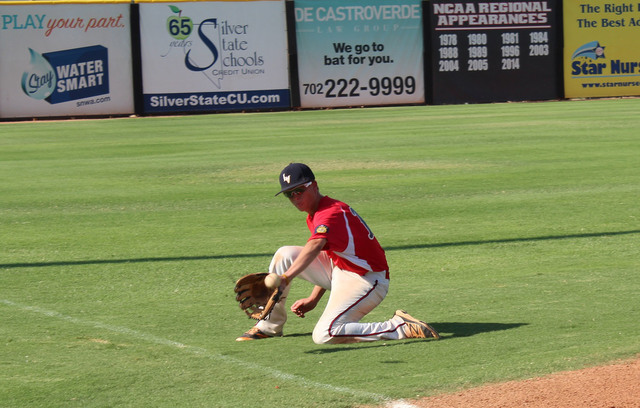 The Hawks play Centennial on Wednesday at 5 p.m. in an elimination game. 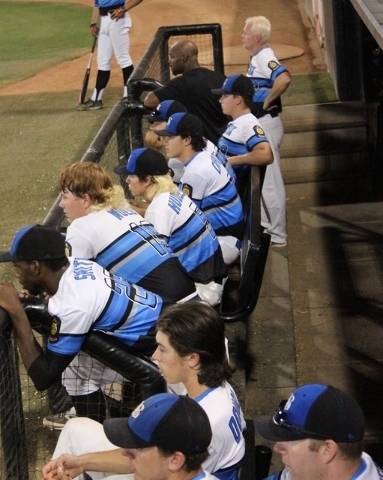 The Blue Sox may not know their next opponent, which will be determined by four games to be played over the next two days. Nevertheless, whichever squad they face that night in the 8 p.m. contest, the task remains the same with one goal in mind. The Bulldogs used a 14-hit attack to eliminate the Patriots in Monday’s first game. After falling behind 2-1 in the first inning, the Bulldogs (19-16) outscored the Patriots 11-3 in the fourth, fifth and sixth innings to pull ahead 12-5 before coasting to a victory. Brett Berger led the offense, going 4-for-5 with a triple, two runs scored and six RBIs, while Brian Wyche went 3-for-4 with a run scored and an RBI, and Jacob Rogers went 2-for-3 with four runs scored and three RBIs. Tanner Wright (3-0) scattered three hits while allowing four earned runs and striking out three over 5 2/3 innings to earn the win. 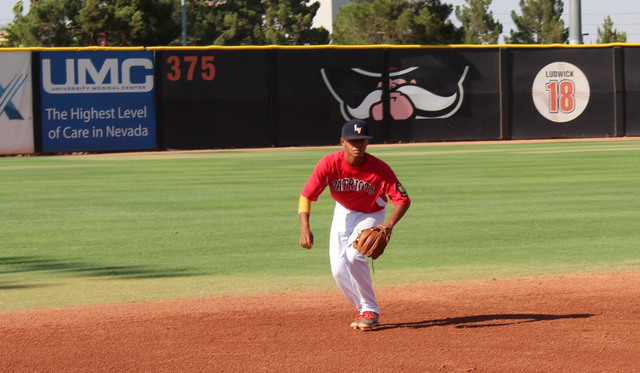 The Patriots (16-23-1) were led offensively by starting pitcher Jordan Moreno, who was 2-for-5 with a home run, one run scored and two RBIs. Moreno took the loss and fell to 1-4 on the season after allowing seven runs (three earned) over four innings.